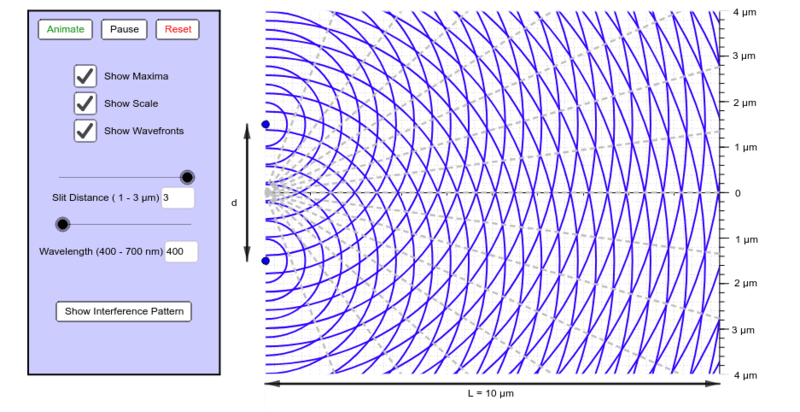 This is a simulation of diffraction of light by a double slit. Use the sliders to adjust the distance between the slits and the wavelength of the light. Use the checkboxes to show or hide the wavefronts, maxima, and vertical scale. Use the Show Interference Pattern button to create the interference pattern that would be seen on the screen. Note that the distances in the simulation are all very small, so that you can see the wavelength separations. The y distances shown in the scale and the distance from the slits to the screen (L) are proportional, so they can just be thought of as meters or any other convenient unit.